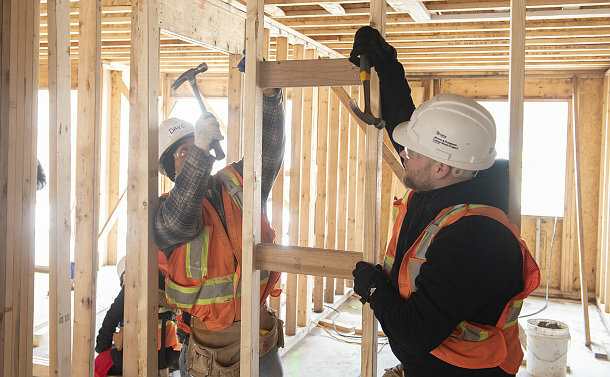 Neighbourhood Officers from 42 Division traded forge caps and gun belts for tool belts and hard hats on April 9 to help build up the Malvern community they police through a Habitat for Humanity Greater Toronto Area (GTA) build. Sgt. Julie Evans and six of her officers spent the day helping to build the new townhouses at 140 Pinery Trail in Scarborough. Semira Hussain, a married mother of five, relished the opportunity to work with the police for a day. Hussain is one of 20 families that will move into the new units when they are completed. Last year, about 7,500 volunteers donated almost 155,000 volunteer hours to Habitat for Humanity GTA builds.